LiveConnections presents a concert crossing musical and cultural boundaries. 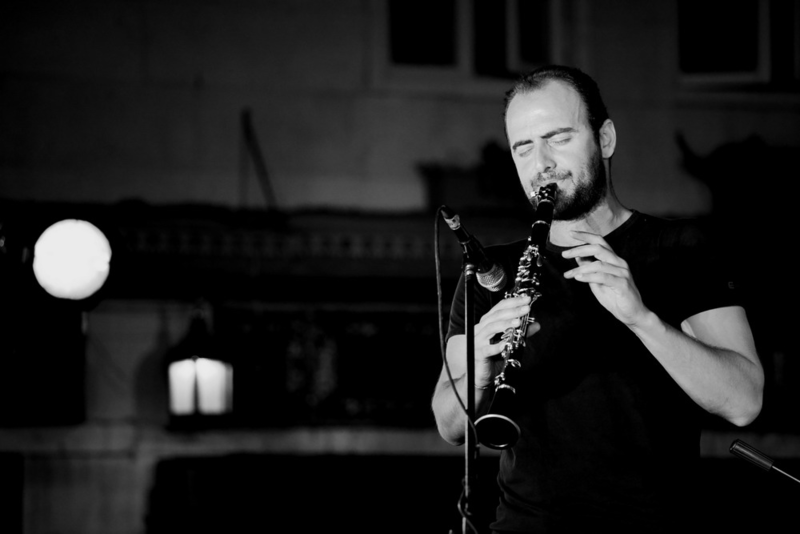 Called “spellbinding” by The New Yorker and “virtuoso…intensely soulful” by the New York Times, clarinetist Kinan Azmeh strives to reach a balance between classical, jazz and the music of his homeland, Syria. 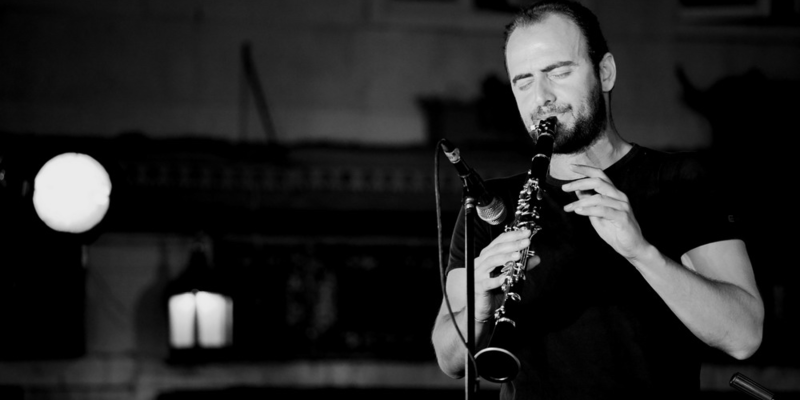 Performing with his New York ensemble, Azmeh’s expressive clarinet meets Kyle Sanna‘s rustic guitar, soaring over the dynamic and volatile backdrop of John Hadfield‘s percussion and Josh Myers‘ double bass. Each band member’s varied background adds a personal flair to this ensemble, resulting in a thoroughly exciting and rewarding listening experience. See these talented artists up close in the intimate space of the Upstairs Live venue at World Cafe Live, Philadelphia, while enjoying dinner and drinks. Doors open at 6:30pm for dinner; the show starts at 7:30pm. 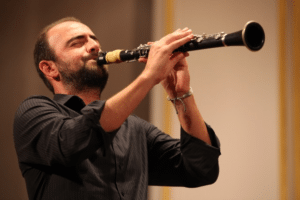 Kinan Azmeh, clarinet, has been hailed as a “virtuoso” by the New York Times with an “incredibly rich sound” by the CBC. Born in Damascus, Azmeh was the first Arab to win the premier prize at the 1997 Nicolai Rubinstein International Competition, Moscow. He is a graduate of New York’s Juilliard school as a student of Charles Neidich and the Damascus High institute of Music where he studied with Shukry Sahwki, Nicolay Viovanof and Anatoly Moratof, and he is currently finishing his doctoral work at the City University of New York. Azmeh has appeared worldwide as a soloist, composer and improviser. Notable appearances include Opera Bastille, Paris; Tchaikovsky Grand Hall, Moscow; Carnegie Hall, Alice Tully Hall and the UN’s general assembly, New York; the Royal Albert hall, London; Teatro Colon, Buenos Aires; der Philharmonie; Berlin; the Library of Congress, the Kennedy Center, Washington DC; the Mozarteum, Salzburg; and the Damascus opera house for its opening concert in his native Syria. As a classical clarinetist, he has appeared as soloist with the Bavarian Radio Orchestra, the West-eastern Divan Orchestra, the Kiev Camerata, the Corasara Orchestra and the Syrian Symphony Orchestra, among others. He has shared the stage with Marcel Khalife, Daniel Barenboim, Zakir Hussein Francois Rabbath, Solhi-al-Wadi, Manfred Leuchter, Kevork Mourad and members of the Berlin Philharmonic Orchestra, among others. Compositions include several works for solo, orchestra and chamber music, as well as works for film, live illustration and electronics. His discography include three albums with his ensemble HEWAR, several soundtracks for film and dance and a duo album with pianist Dinuk Wijeratne. He serves as artistic director of the Damascus Festival Chamber Music Ensemble, with whom he released an album of new contemporary Syrian chamber music written especially for the ensemble by various composers.